A Ticket. A Book. A List. Last Saturday when I was buying the weekend newspapers I also bought a lottery ticket. Lottery tickets are not something I buy regularly as I tend towards the view that as the chance of winning is so remote it is wiser not to fall for the marketing line ‘if you are not in you cannot win’. 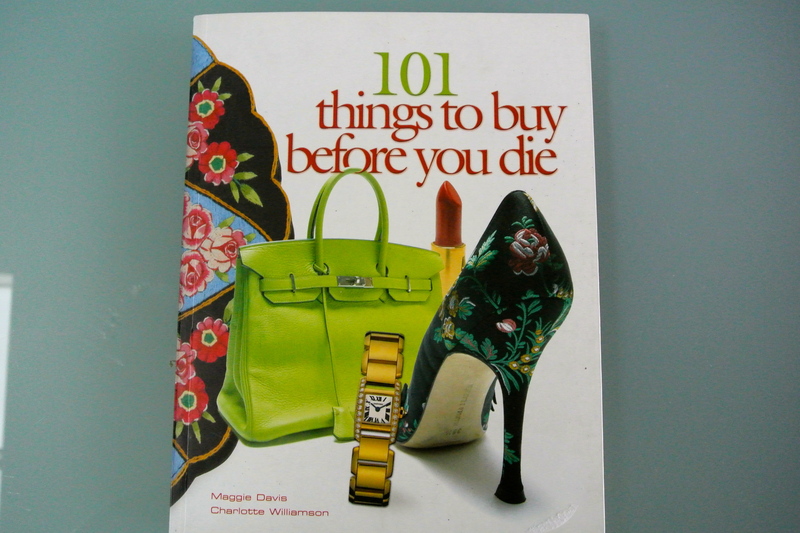 Over the weekend when I was doing some sorting out I came across a book, which I had bought a few years ago, with the somewhat materialistic title of 101 Things to Buy Before You Die. Obviously the 101 things are the subjective choices of the authors Maggie Davis and Charlotte Williamson. In the introduction they bill their list as ‘the very best in food, fashion, furniture and fun’. The book lists many high-end luxury goodies mixed up with some affordable items such as: bars of Savon de Marseille at around three euro each; an under two euro scoop of Sicilian ice cream; and sub twenty euro tee shirts from the Gap and Petit Bateau. As I flicked through the book my yet unchecked lottery ticket was burning a hole in my wallet. So I decided to indulge in a round of what-would-I-buy if I won the lotto. I had a couple of rules: I could only pick five items; they had to be different from the ones I had seen listed in 101 Things to Buy Before You Die; and obviously I couldn’t include things I would normally treat myself to. It was easy. The difficulty was, of course, stopping at five. Here’s my list. A first class return plane ticket to Sydney (accommodation naturally in a suitably lovely boutique hotel). A set of Hans Wenger wishbone chairs. A totally simple and totally chic made to measure little black dress. I still haven’t checked to see if my lotto ticket was a winner so I am off to do so now. In the unlikely event of my next post including images of the Sydney Opera House you can assume my numbers came up. If only. C I am glad you concur with the idea of a LBD. I totally forgot about somewhere suitably elegant to wear my imaginary dress to – I will have to add an imaginary event to my list. Fine dining followed by the Sydney Opera, of course! Thanks so much Meg … that’s a lovely thought. It would be lovely if you won. Thank it would have been nice. However I didn’t win! I was hoping you would win. I could say that I knew you when. Then I would be able to say… look at her now in that little black number sitting in the front row of the opera in Sydney. Thanks Karen. It was not to be. I hope to get to Sydney some day but it’s not going to be on a first class flight and the LBD will be from the high street!